Inc. magazine has ranked laminating and binding supply company Lamination Depot in position 3,138 on their 2015 Inc. 500|5000 list, which recognizes the fastest-growing, privately-owned companies. Lamination Depot ranks no. 260 among all companies listed in the Business Products & Services category and no. 465 among Business Products & Services companies within California. This is Lamination Depot's fourth appearance on the list, after their debut on the 2012 Inc. 500 | 5000 and subsequent appearances on the 2013 and 2014 editions. Over the course of the evaluation period, which spanned from 2011 through 2014, Lamination Depot increased their revenue by 109% and nearly doubled their staff. Among the contributing factors to this growth are the expansion of their own supply and equipment brands, the addition of new vendors to their supply chain, and an increased emphasis on lowering operational costs. During the past year, Lamination Depot has focused on cost-saving measures and business efficiencies that have enabled them to pass additional discounts along to their customers. Building upon the successful launch of TruBind and TruLam – Lamination Depot's own line of branded supplies and equipment – in early 2014, they added dozens of new private-label products throughout the year. Additionally, Lamination Depot has increased their workforce by more than 75% over the three-year evaluation period, which has allowed them to continue providing the same level of service to their growing customer base. "To be included on the Inc. 500|5000 list is an immense honor, but making our fourth consecutive appearance on the list is an accomplishment that is cherished by every member of our team," says Paul Godfrey, Founder and President of Lamination Depot. "Our staff has been diligent in seeking out new methods for reducing our operational costs and finding innovative ways to make every aspect of our company more efficient, which has given us the opportunity to help our customers save even more. It is our drive for continuous improvement and constant evolution that has allowed us to achieve the growth that has earned our spot on the Inc. 500|5000 four years in a row." A complete list of all Inc. 500|5000 honorees is available on Inc. magazine's website, at www.inc.com/inc5000/. To view Lamination Depot's complete profile, visit www.inc.com/profile/lamination-depot. Inc. magazine has ranked laminating and binding supply company Lamination Depot in position 3,641 on their 2014 Inc. 500|5000 list, which recognizes the fastest-growing, privately-owned companies. Lamination Depot ranks no. 277 among all companies listed in the Business Products & Services category and no. 27 among Business Products & Services companies within California. This is Lamination Depot’s third appearance on the list, after their debut on the 2012 Inc. 500 | 5000 and subsequent appearance on the 2013 edition. Over the course of the evaluation period, which spanned from 2010 through 2013, Lamination Depot increased their revenue by 87.2%. Among the contributing factors to this growth are the launch of their own supply and equipment brands, the addition of an array of new products, and the expansion of their shipping, customer service, and outside sales staff. During the past year, Lamination Depot has focused on adding new products to their website, with more than 700 new items listed. Beyond the expanded product catalog, they have also been able to offer discounted pricing on existing products by launching their own line of branded supplies and equipment, sold under the TruBind and TruLam names. Additionally, Lamination Depot has increased their workforce by more than 30% year over year, so that they can continue providing the same level of service to their burgeoning customer base. The Orange County Business Journal has released its annual Fastest-Growing Private Companies list, which recognizes Orange County-based companies that are experiencing the highest growth in revenue. Lamination Depot makes its second appearance on the list &#8211; ranking no. 102 after debuting at no. 110 in 2012. To evaluate the growth of a business, the Orange County Business Journal compared the revenue generated from July 2012 through June 2013 to that of the same period two years ago. Lamination Depot had a two-year revenue growth of 62.2%, increasing sales from $2.5 million to $3.4 million. "Orange County is home to such a diverse and impressive range of businesses, including emerging brands, long-established ventures, and everything in between," says Paul Godfrey, Founder and President of Lamination Depot. "It is an honor to be included amongst this distinguished group of businesses for two years in a row, particularly in a time that has been challenging for many industries. By staying focused on our core business values &#8211; customer service, fast turnaround, and exceptional value for money &#8211; we've been able to continue to grow our customer base both locally and nationwide." To learn more about the Orange County Business Journal or their annual Top 150 Fast-Growing Private Companies list, visit www.ocbj.com. Inc. magazine has ranked laminating and binding supply company Lamination Depot in position 3,411 on their 2013 Inc. 500|5000 list, which recognizes the fastest-growing, privately-owned companies. Lamination Depot ranks no. 274 among all companies listed in the Business Products & Services category and no. 41 among Business Products & Services companies within California. This is Lamination Depot's second appearance on the list, after their debut on the 2012 Inc. 500 | 5000. Over the course of the evaluation period, which spanned from 2009 through 2012, Lamination Depot increased their revenue by 91%. Among the contributing factors to this growth are the additions of new product lines, an expanded outside sales force, and an increased international presence. Many of the company's enhancements over the past year have been fueled by customer feedback. A broader range of shipping options have been implemented, allowing clients to select the most economical option based on their delivery needs. In addition to reducing shipping rates overall, a new promotion gives customers who place order totaling $199 or more complimentary ground shipping. "To make the list of the fastest-growing companies two years in a row is an achievement that we hold in the highest regard – especially in a time that has been challenging for many businesses," says Paul Godfrey, Founder and President of Lamination Depot. "We've stayed true to our goal of providing the best possible experience for each of our customers – from the breadth of products we carry to the ease of ordering to the time it takes an order to arrive – and that has allowed us to continue to thrive in the current economy. The feedback provided by our customers has been an invaluable resource in shaping our business for the future." Laminating and binding supply company Lamination Depot is the leading laminating pouch and roll laminating film supplier in the industry, with more than 450 combined varieties in stock. They also stock a huge selection of binding and laminating machines, totaling more than 400 machines from 18 manufacturers. To help local businesses learn more about the wide variety equipment that they offer, they’re holding free Open House at their office on Friday, March 15th. This event, being held from 1:00 pm to 4:00 pm, will feature hands-on equipment demonstrations, free product samples, giveaways valued at more than $1,000, and a complimentary light lunch. Featured manufacturers include Powis Parker, Rhin-O-Tuff, RENZ, Ledco Inc., and Dry-Lam, all of which will have representatives on-site to answer questions and provide in-depth overviews of their binding and laminating equipment. "These days, businesses of all types are looking for ways to cut costs and increase their efficiency, but bringing their binding and laminating projects in-house is a huge opportunity that is often overlooked," says Paul Godfrey, Founder and President of Lamination Depot. "This event gives business owners a chance to see the latest innovations in binding and laminating, to get a hands-on education in document finishing, and to discover how much they can save compared to outsourcing. With all of the new developments that manufacturers have made in the world of document finishing, I think that attendees will be surprised by how easy and affordable it has become." Lamination Depot invites individuals and organizations to attend their Open House on Friday, March 15th from 1:00 pm to 4:00 pm. R.S.V.P.s are requested, and can be submitted via email at rsvp@laminationdepot.com or by calling 1-800-925-0054. The first 50 people to R.S.V.P. will receive a $10 Starbucks gift card upon arrival to the event. 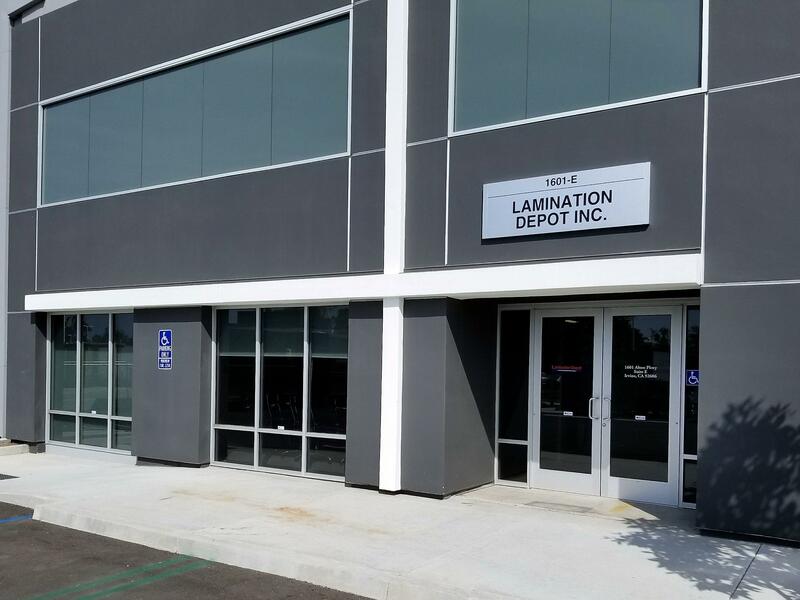 Lamination Depot is located in the Las Palmas Business Park at 1505 East McFadden Avenue in Santa Ana, California (near the intersection of the 5 and 55 freeways). In late 2011, Lamination Depot embarked on project to upgrade our main distribution facility in Santa Ana, CA with state-of-the-art technology that would enable us to reduce our utility costs by over 50%. As a result of these efforts, we have achieved our goal and are proud to be one of the "GREENEST" distribution facilities in the United States. We began by moving our entire computer infrastructure to the cloud. This enabled us to shut down numerous servers and also eliminate the need for a dedicated air conditioning unit for the server room. Next we removed all of the fluorescent tube lighting from the warehouse and installed large skylights in the roof. The warehouse is now illuminated by 100% natural sunlight that comes through the skylights and exterior doors. Only on extremely cloudy days is it necessary to use the auxiliary backup lighting system which is comprised of only 7 high output compact fluorescent bulbs. All office lighting was replaced using the latest LED technology controlled by occupancy sensors which turn the lights off in unoccupied areas of the facility. The LED lights produce a very pleasant light, consume less than 50% of the power of the fluorescent lights they replace, produce virtually no heat, contain no mercury and last up to 5 years. The HVAC system was upgraded to utilize NEST thermostats which connect to the internet via WI-FI to monitor weather patterns and automatically determine the most efficient method of cooling and heating the facility. Lastly, all computers in the office were replaced with high efficiency Apple Mac Mini computers that exceed the ENERGY STAR requirements by consuming only 85 watts of power. We are very proud that we are doing our part to be more energy efficient and reduce our carbon footprint. For a limited time, Lamination Depot will make two of your personal business cards into luggage tags for free. Simply mail us two of your business cards and include a self-addressed, stamped return envelope. We will thermally laminate your business cards in a durable 10 mil luggage tag laminating pouch. We will include two clear luggage loops that will enable you to attach your new luggage tags to your luggage, briefcase, backpack or any item that you want to identify. These professional looking luggage tag laminating pouches will last for years and provide easy identification of your personal items. One first class postage stamp will be adequate for the return postage. Allow 14-21 days for processing and receipt of your your new luggage tags compliments of Lamination Depot Inc. This offer is limited to only two free luggage tags per person. Additional luggage tags may be purchased for $2.50 each plus return shipping.